The coach revealed that there will definitely be two warm-up games before the Asian Cup, sometime in December. 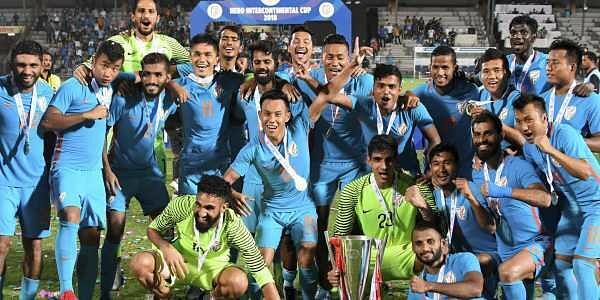 MUMBAI: The Indian football team showed a lot of character and resilience in its title-winning Intercontinental Cup campaign and the attitude would be crucial to ensuring that the country doesn't just make up the numbers in next year's AFC Asian Cup, feels national coach Stephane Constantine. Lavishing praise on talismanic skipper Sunil Chhetri, who scored both of India's goals last night, and goalkeeper Gurpreet Singh Sandhu, Constantine said the two players hardly ever need to be told what the situation demands of them. "Sunil and Gurpreet (Singh Sandhu) are two (members) of the squad, they will tell you themselves, they can tell what they do. Sunil is unbelievably fit, looks after himself, completely professional on and off the pitch, and that is why he is able to maintain the level of fitness that he has," Constantine explained.